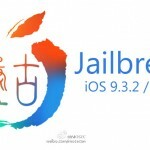 Pangu Team released iOS 9.2 – 9.3.3 jailbreak update of English version jailbreak tool. The new version, Pangu 1.1 has fixed some bugs and improved stability of jailbreak. Also it has Added 1 year Enterprise Certificate for jailbreak app. So, you no longer have to re-install Pangu jailbreak app every week until April 2017. This will be really good news for Pangu English users all around the world. Here we like to show all necessary information for user to jailbreak iOS 9.2 – 9.3.3 with install Cydia using new Pangu V1.1 tool. Few days ago, Pangu Team released Chinese version of jailbreak for iOS 9.2 – 9.3.3 first time. Later, Pangu V1.0 English tool released for international users. Now, Pangu V1.1 the latest tool available to download & install with Cydia Impactor tool. Pangu V1.1 English tool supports to jailbreak & install Cydia for iOS 9.2 – 9.3.3 running iPhone, iPad & iPod on Windows, Mac & Linux platforms. Pangu Chinese tool combined with PP tool but, Pangu English version uses Cydia Impactor tool which developed by the Saurik to help of the jailbreak process. New Home Depot jailbreak iOS 9.1 – 9.3.4 released! Apple 32-bit device users also can download Cydia for their device now. Backup your device, Find My iPhone Disable, Disable Passcode. Please follow these instructions before use this tool. You need to download Cydia Impactor tool compatible with your operating system with official website. Run Cydia Impactor tool on your computer. You can See the tool detected your device properly. Drag and Drop downloaded IPA file on to Cydia Impactor as follows. Enter valid Apple ID and click “OK” . Then enter Apple ID Password and click “OK” to continue. Note – Your regular Apple ID can be used here. However, it’s better to create a new Apple ID to continue with this process. Apple ID is used for create a free Apple developer certificate for signing the iPA file of Pangu jailbreak. The certificate will expire in 7 days (A paid developer certificate lasts 1 year). 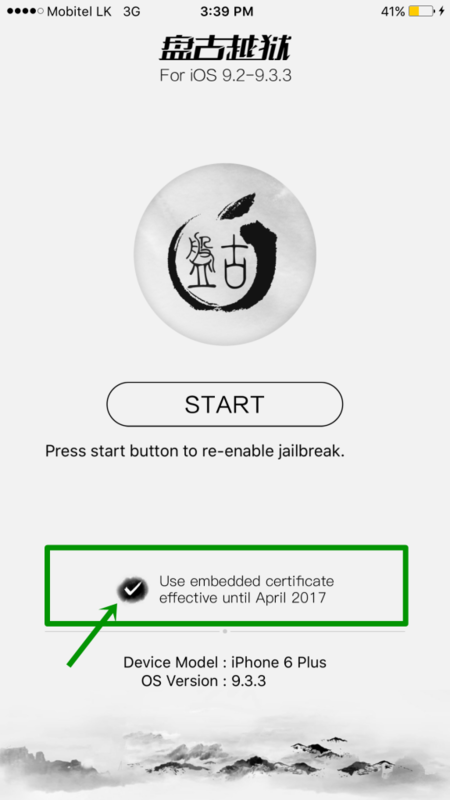 If your certificate gets expired you can’t use Pangu app on your Home screen to re-jailbreak. Then you have to remove Pangu app from your device & need to follow these full steps again. Pangu V1.1 includes an option for get 1 year Enterprise Certificate. So, you no longer have to re-install Pangu jailbreak app every week until April 2017. You will receive Apple warning. Click “OK” button to continue. Wait and observe the process. Once the process completed you can see start button on the Cydia Impactor. You are already done and now you can close the Cydia Impactor. Go to your iOS device’s Home Screen, you can see Pangu App on your home screen. Now you need to trust installed profile with Settings > General > Device Management and select the profile associate with your Apple ID. Tap Trust and Tap Trust to Pangu app to execute with your device. Then launch Pangu app in home screen. Tap Start to continue jailbreak process. Please make sure to tick the option that says “Use embedded Certificate effective until 2017“. That allows you to get 1 year Enterprise Certificate for you jailbreak. Then lock your device by pressing sleep button. Two notifications will appear. 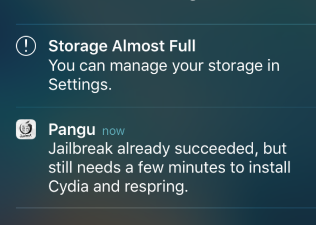 One is storage full and other one is Pangu message. Ignore – Storage Full message. Pangu message – Wait to install Cydia and relevant files. Wait and Observe the process. After few moment your device will respring automatically. Then you can see Cydia with your home screen. Now you have successfully jailbroken iOS 9.2 to 9.3.3 device with Pangu English version. Now you all ready to customize your idevice. Launch Cydia on your device, there are thousands of amazing apps, themes, extensions available to modify your device. You can find best Cydia apps & tweaks in bellow list.. Unable to jailbreak your device with Pangu ? Just follow bellow guide to fix common issues & jailbreak successful.. This is semi-untether jailbreak. So, you need to re-run the jailbreak after each reboot. Do not delete the Pangu app on your device’s Home screen because you will need to re-execute the app to use Cydia & jailbreak tweaks after restart your device. I get this message.Any idea what I can do? This error is normally coming with 64 bit devices. But some 64 bit devices also faced with this error. Yes, Pangu will not release solution to jailbreak 32 bit devices. Please download tool again & run as admin. I copied the IPA file and then I get a provision cpp 68 error stating that it cannot be completed due to maintenance reasons. Please drap and drop ipa file to Cydia Impactor. Download latest version again and restart device and computer. Everytime I try this method on my macbook I keep getting error “lockdown.cpp:57 LOCKDOWN_E_INVALID_CONF” what does this mean and what actions should be taken? This is Pangu server error. After I put in my Apple ID it says “cannot unzip IPA” for the NVWAstone file. I see other people are having the issue too. It’s weird, my wife and I had our phones jailbroken with this method for about a week then all of the sudden it stopped working and we couldn’t open the pangu app so I’m trying to re-do it now. Did you create new Apple ID ? If old Pangu app installed to your device. I was able to jailbreak my 6s+ using your instructions above. After installing verified tweaks that would work with iOS 9.3.3, Bejing Hong Yuan Online Technology, for the enterprise certificate, is no longer trusted. There is a “verify” button, but it does nothing. Additionally, the Pangu app says “Untrusted Enterprise Developer” and I can run the app. Sorry, I CANNOT run the Pangu app. Please trust this source to verity Pangu/PP application. Otherwise Pangu will not run. 1.Please download latest version with our direct links. 2.Restart process as new one. what can i do with this error? how to fix it? We have seen some users faced with Pangu server errors. – Run application after reboot device and PC. Is there a way to install Cydia without running Pangu? No, Pangu is the one and only jailbreak solution for iOS 9.2 – 9.3.3 users to install Cydia for their idevices. Check and Trust security certificate. When press sleep button, you can see two messages. Better to follow Youtube videos related with Pangu to install Cydia. Will this jailbreak work on an unactivated iPhone? Why do iPhones have to be activated with a network today? How can I activate my CDMA iPhone SE? I have been to all 4 carriers and they say the iPhone is unknown in the system and they do not know how to activate, but iPhone says I must have a SIM card. I do not use or want a SIM card or service. I just need to use as a compass to hike. How can I fix to use the compass? I have tried every SIM card on the market. Jailbreak not work with unactivated iPhone. Please find carrier unlock service on the web, we can only help for Cydia & jailbreak problems. What i must to do ? Did you jailbreak device with Pangu ? When this message appear ? Can i jailbreak my iPhone 5c 9.3.3 ? 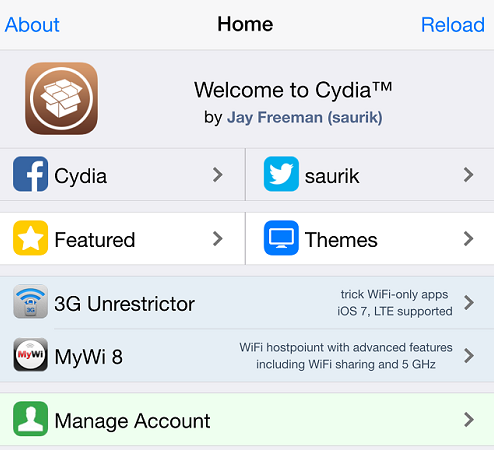 Cydia can install for your device with Pangu jailbreak tool. Pangu is one and only method to jailbreak your device and install Cydia application. Do not use iFunBox to install Cydia application. hi i have iphone 6s plus 64gb ios 9.2.1. I tried seince 6 hours everythink to jailbreak. Jailbreak working perfect for iOS 9.2.1. Something went wrong. Better to reboot your device and follow Cydia Impactor method. Better to follow Youtube video and find your fault done with jailbreak. Will this expire after 1 week? Will I be able to jailbreak all three phones without problem?